I am so used to having Christmas decorations all over the house when I was still in the Philippines. Every year, around November, we would all have a house general cleaning. That would signal that we will soon be putting up the Christmas decors. We would then put up the Christmas tree and the decors around the end of November at the earliest. Or we would postpone it until later or on December 16th, the start of the Simbang Gabi (Misa de Gallo) or the nine day novena mass. I really miss putting up Christmas decors and I can't believe that I don't have any Christmas decor around the house this time of the year, not even a live Poinsettia plant. 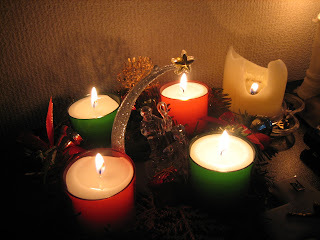 When we were still in Japan, I only had an Advent wreath and a very tiny nativity scene. The frugal wife in me says that I don't need to buy all those expensive decors just to feel Christmas. The child in me is itching to buy some just to give a little Christmas spirit in our home. But I guess it really doesn't matter much whether I have them around or not as long as I feel the cheer and the importance of the season here in my heart. That is what really matters right? But I am not resting my case. Perhaps, when we are all settled in one place and Sam is big enough, then I can finally invest on them and have Sam experience all the wonder of it. Also, we won't be spending Christmas and New Year here so might as well forego decorating until next year. How about you? What's your Christmas decor? Come share it with us here on Girls Talk! Click on the badge below for more! it wasn't really me who decorated my Christmas tree but my kids.. and you'll be surpised one day, si Sam na magdecorate ng house niyo..
Dito sa Japan medyo malungkot ang pasko,dati nga mula Christmas eve lang naka up ang tree dito sa amin tapos wala na sa 26 pero ok lang medyo nasanay na rin ako--di kasi sila Christian kaya ganun siguro. Same feelings here. We are staying in an apartment in Manila because we are on upgrading, i missed this time of the year when we start decorating, got to go home to see moms decor. Nice set of candles simple and elegant..